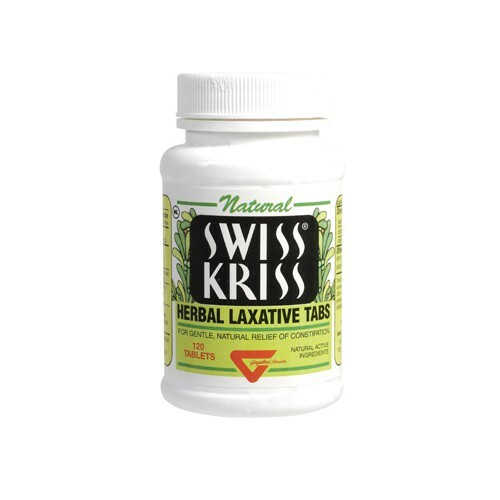 Natural Swiss Kriss Herbal Laxative Description: For Gentle, Natural Relief of Constipation Swiss Kriss (Senna) (Cassia Angustifolia) is used as a powerful cathartic in the treatment of constipation. These Swiss Kriss herbal laxative tabs are naturally different. Known world-wide as the smoothest, most satisfying laxative, Swiss Kriss tabs are 100% natural, contain no harsh synthetic drugs, effective ingredients consist entirely of Nature's Own sun-dried leaves herbs and flowers. Swiss Kriss contains a blend of herbs and flowers that work in harmony with the body to relieve chronic or sporadic constipation and promote regularity without the side effects of synthetic laxatives. Free Of Harsh synthetic drugs. Disclaimer These statements have not been evaluated by the FDA. These products are not intended to diagnose, treat, cure, or prevent any disease.